Rabbits are universally regarded as cute, cuddly creatures. Almost every little girl is drawn towards their soft fur, furtive little eyes, and adorable teeth that constantly nibble into something. It’s hard to imagine these creatures as being bothersome to anyone, until you try to put together a vegetable garden. And that’s when you realize the voracity of their appetite and how incredibly damaging it is to your puny little garden. Despite our attempts to thwart these creatures, we lost all our budding cauliflower and tomato plants last year. Now, every time we see a flash of brown and white, our hearts leap to our mouth, shrieking out exasperated warnings to save the plants. More sturdy fences have been erected, bunny-repelling plants have been grown and holes have been stuffed and covered. In essence, vigilance is strict this time. That’s when I was reminded of Watership Down. It’s a book that I have been wanting to read for a long time, because of my love for rabbits, and any book that deals with animals and their survival. And ever since we started our little battle against rabbits in our very own yard, the book has pressed itself on me as a must read. In a nutshell, Watership Down is a classic portrayal of rabbits in the wild - their hierarchy, social structure, and survival mechanisms. A gang of rabbits vacate from their burrows to escape human encroachment, and are on the run to find a nice little place for themselves to settle down, far away from the nagging cruelty of humans and live in peace. Headed by brave rabbits, and by the timid and intelligent little Fiver, whose intuition and perspicacity helps the rabbits sniff out danger before it strikes them, they shuttle from one adventure to another in their stiff battle towards survival. Throughout the story, Richard Adams infuses interludes of interesting rabbit mythological tales and the rabbits’ beliefs of an omnipotent creator and his hand in their lives. While the tales were interesting asides in the beginning, they started to wear me down a little as the story progressed, because it gave the book a meandering feel and took my interest away from the story. And while the story itself was endearing, and the writing was quite beautiful, there wasn’t enough happening in the story to hold my interest through its 500 odd pages. Yet there was always a nervous edge to the story that piqued enough curiosity in me to persevere with the book till the end. Despite anthropomorphizing the animals, Adams maintains an honest perspective of rabbit psychology and physiology, thus bringing us closer to understanding their ecology. However, Adams also subtly likens the similarity of our race for survival, with the rabbits’. In the end, all of God’s creations act and work on the same core instincts, hanging on to their own illusions and perceptions of the Universe and everything that is beyond their control. Watership Down is quite worthy of its fame, although it might appeal better to young readers. 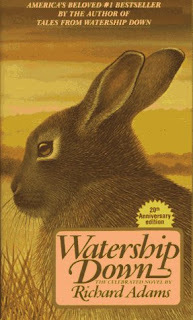 And finally - Did the book make me cringe with guilt for shooing off the rabbits in our yard? Most definitely yes.